On Monday December 8th, WISER successfully launched its new Community Outreach Programming course, Introduction to STEM Careers. This course was developed in collaboration with the University of Pittsburgh�s Department of Biological Sciences Outreach program and it was designed to introduce middle school and high school students to different Science, Technology, Engineering, and Math (STEM) careers, through hands-on, inquiry based activities. 9th grade students, from Pittsburgh�s Science and Technology (SciTech) academy rotated through 4 different modules, where each facilitator introduced their career paths and focused on particular STEM topics. 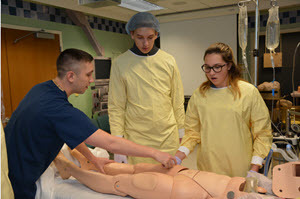 In the nursing module, students were taught Bystander BLS using adult and baby manikins. In the technology module, students ran the simulator software and were given an in-depth tour of the simulator technology. 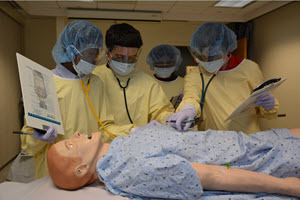 In the healthcare provider module, students entered a hospital ward of 3 simulated patients exhibiting varying symptoms of a viral outbreak and learned patient assessment techniques while collecting data on the patient�s vital signs. Finally, the patient assessment data was used in a final research module, where students had to use basic laboratory techniques to identify the causative agent in the viral outbreak. A big thank you to Dr. Becky Gonda, the Pitt BioSci middle school outreach coordinator and Mr. Brian Rose, 9th grade science teacher at Pittsburgh SciTech Academy. WISER�s community outreach programming is available to all schools; please contact wiserhelp@upmc.edu if you are interested in learning more.